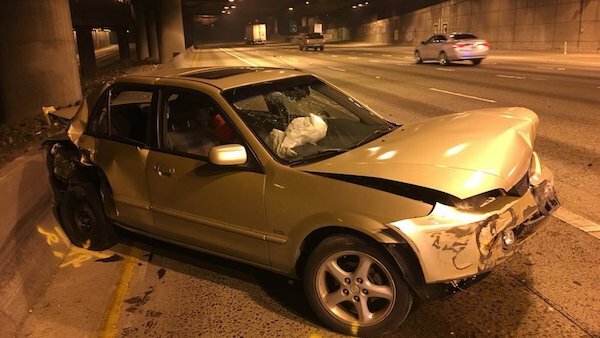 A person suspected of driving under the influence of drugs or alcohol caused a two-vehicle crash early Tuesday morning on Interstate 5 in downtown Seattle, according to the Washington State Patrol. The incident occurred at 2:46 a.m. on southbound I-5 near the Convention Center. A 27-year-old Seattle man in a Mazda 6 4D rear-ended a Mazda Protege 4D, pushing the Protege into the barrier on the left side. The 61-year-old Tukwila man driving the Protege was transported to Harborview Medical Center for treatment of a possible broken leg. The causing driver was arrested for investigation of vehicular assault and DUI. The roadway was partially blocked for four hours. In certain situations, the drunk driver who caused the collision may not be the only responsible party. In Washington state we have a Dram Shop law. This law may allow you to impose liability on the drinking establishment (restaurant, bar, tavern, hotel, etc.) or social host that supplied the alcohol to the drunk driver. Washington’s Dram Shop law provides that the establishment or social host who serves alcohol to a person who appears intoxicated, may be civilly responsible for paying damages to victims injured by the patron in a subsequent drunk driving collision. Dram Shop laws vary from state to state. Therefore it is very important to consult with an attorney about the laws in your state to determine whether the seller or supplier of alcohol might be liable. Some other states limit Dram Shop liability to circumstances when alcohol is served or sold to someone who is visibly intoxicated. Also, it’s important to keep in mind that an employer may also be held liable for the damages caused by the conduct of its employees or agents in some circumstances. If, for example, the employer hosts a work function where alcohol is served and one of the employees consumes alcohol and then later causes a drunk driving collision. Unfortunately, drunk driving accidents occur every day. Davis Law Group, P.S., is here to help. Our knowledgeable drunk driver attorneys can help ensure the proper steps are taken to get the best possible outcome for your case. If you were the victim of an impaired driver, contact us today for a free case evaluation with one of our attorneys. You will pay nothing unless we can win your case.